Green. Red. White. All the colours of the Italian flag are represented here. Because of its uncomplicated nature, this recipe relies on excellent ingredients. Make the gnocchi by mixing together the potatoes, flour, spinach and egg, adding more flour if the dough is too wet. Season lightly. Using your hands, roll the mixture into little sausage shapes. Cut these into 3cm chunks, then press one side of each gnocchi with the tines of a fork to create a ridged impression. Make the simple tomato sauce by frying the garlic in the olive oil for a few minutes, until soft. Add the tomatoes, basil and some salt and pepper, and cook for about 20 minutes. Cook the gnocchi in salted, simmering water for about a minute or until they float to the surface. When ready, drain, then add the sauce, parmesan and some pepper, and mix well. 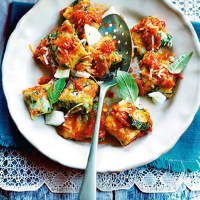 Divide the gnocchi between the plates, sprinkling over the mozzarella cubes and some more basil leaves to finish. This simple yet satisfying meal of dense textures and powerful flavours would suit a juicy, soft chianti. Waitrose Chianti 2007/08 Tuscany, Italy. Bin 82016; £4.99.